Otherworld marks the meeting of two musicians, Peter Hammill and Gary Lucas, who have made careers out of bridging the avant-garde with the popular, in very different ways. Lucas is well-known for, among other things, playing seemingly impossible compositions for guitar as part of Captain Beefheart’s Magic Band, working with the late Jeff Buckley, and providing a live accompaniment to a screening of the 1920 German film The Golem is nothing if not a natural collaborator – his recordings and live performances with other musicians are legion. Hammill, on the other hand, has been relentlessly following his musical vision since the late 1960s, both solo and as a key member of Van der Graaf Generator, on a path that he has traveled mostly alone, with only a small, and progressively thinning, coterie of musicians to accompany his vocals and keyboard or guitar playing. In recent years, his solo albums have been truly one-man shows. Given Hammill’s apparent reticence in the area of collaboration, Otherworld comes as quite a surprise. And the album is surprisingly powerful. There is an alchemy here between these two mavericks that mixes the very different styles of guitar playing (Hammill’s competent but deliberately abrasive electric guitar riffs, and Lucas’s virtuosic playing that ranges from ambient to bluesy to effects-laden as called for) into something like musical gold. Many bases are touched here: the opening gentle ballad “Spinning Coins,” the riff-driven “Cash,” and the eerie “Some Kind of Fracas” are just a few examples. “Spinning Coins” sets the album up to be a typical contemporary Hammill album; odd but not too bizarre chord sequences and lyrics that start with “her” leaving “him” and ending with a musing on how all life events may be based on randomness. It could be on any Hammill album — Lucas’s presence isn’t very noticeable yet. But then things get weird. The second song, “Some Kind of Fracas,” features the vaguest of lyrics combined with plodding and stuttering guitar over which one hears layers of sculpted noise. It is eerie and disquieting – which of course translates to pure fun – and things just get better from there. It’s still Hammill’s voice, lyrics, and guitar, but in another — an other — world. Hammill has hinted at times at the possibility of this type of recording. As far back as 1979, he started experimenting with the open-ended possibilities of pure noise on his pH7 album, and continued those experiments through the following year’s A Black Box. Otherworld seems to have allowed Hammill to see these experiments through in a way that he couldn’t have accomplished thirty years ago, given, among other things, his shoestring budget and the comparative lack of recording technology. Many of the songs and instrumental soundscapes on this album sound like the final realization of these efforts. There are a few other ballads on the album, “Of Kith and Kin,” and “Two Views,” but the meat of the recording lies in the instrumental pieces which verge on musique concrete: “Built from Scratch,” and “Slippery Slope.” The former contains some effects that are so over-the-top in a 1950s sci-fi movie fashion, that one’s first instinct may well be to chuckle, but the noises turn from kitschy to sinister in a heartbeat, and then sublimely beautiful birdsong-like noises before finally veering into psycho-terror again. The high point of the album is the song “Black Ice,” which features frenetic and abrasive guitar playing and some of Hammill’s best lyrics, and then cuts into slabs of sheer noise before abruptly picking up the song form again as if nothing had happened. Gary Lucas’s presence is all over this album while Hammill’s cuts straight through the middle. 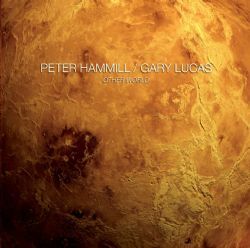 Otherworld fits well into the Hammill canon, but Lucas is indispensable and provides some very challenging playing — less counterpoint than catalyst — that makes this album such an unqualified success. 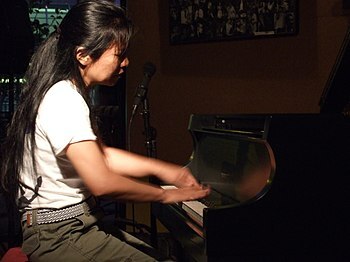 His playing particularly shines in the mostly gentle instrumental “Attar of Roses,” which is reminiscent of the album he released in 2001, Edge of Heaven, on which he reworked Chinese pop songs from the 1930s – 1950s. One gets the feeling that this was a particularly fun project for Lucas — a self-professed long time Hammill and Van der Graaf Generator fan, but it’s just another stop on his musical road. But he gave Hammill the foil he seemed to need to up the stakes a little bit – the vocals are a little bit less restrained than they have been of late. More importantly, the freedom that Lucas provided from sticking to either the strictly song-based structure or the entirely instrumental attempts at experimentation that have been less than successful (see Unsung and Sonix), gave Hammill the inspiration he needed to create some of his most vital music to date. Dominic Lash’s first ever improv gig was a trio with Alex Ward and Pat Thomas; since then he and Alex have encountered each other in bands such as Predicate, Gannets, Barkingside and many more besides. For their duo performances Alex plays clarinet and Dominic plays double bass and they both write compositions which are sometimes calm and quiet and sometimes knotty and noisy, plus they make a bunch of stuff up. Clive Henry and Seth Cooke – the co-founders of Bang the Bore – have played together in various groups, including Hunting Lodge, Masterly! & Farewell and the A Band; while collaborative omnipresence Kevin Sanders maintains a frightening release rate as Petals through his Hairdryer Excommunication label. In this trio they might play metal percussion, electronics and guitar, or something else altogether.